Where Do You Plan To Travel? Yoshiko Chuma and Rebecca Lazier share a program at LaMama. She should know. 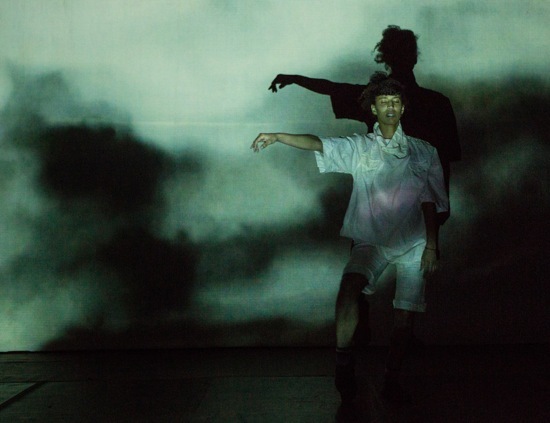 Growing up in Japan after World War II in a culture still shuddering its way out of Hiroshima and Nagasaki, Chuma began the π=3.14… series in 1999, when her School of Hard Knocks performed Footprints of War at the Sarajevo Theater Festival. She has been journeying ever since—to Macedonia, Albania, Romania, and, more recently, Manipur; her works have been performed in many cities. The collages that she assembles out of images, film, artwork, words gathered from interviews, dancing, and music are layered in enigmatic ways, so that—while grounded in political and social issues—her art is never didactic. Watching her pieces entails having sights and sound flash by you in often bewildering or jarring ways. You can no more sort them out on the spot than you could pick nuts and raisins out of pebbles as they pour from a bucket. Yet they collide in your brain in provocative ways. Born in Japan, living in the U.S., Chuma became interested in America’s influence beyond its shores, especially on third world countries, although in her “Artist Statement” she says, “It has been more than 60 years since World War II, but Japan still smells of occupation, as though it is a U.S. colony.” Also, as evinced by the quote at the beginning of this review, she is moved by how ordinary people continue to function in war—how they try to keep working, eating, talking to their friends, educating their children. At some point, in the middle of π=3.14, Ximena Garnica, sitting before a microphone placed on a glowing “light table,” speaks of ajiaco, a soup well loved in Bogotá. The three kinds of potatoes, the herbs, and how it’s best left to grow in flavor “trasnochada,” or overnight. She makes you want some. And you may also think about days when, for many everywhere, there is no soup. The space in LaMama’s little first-floor theater could be seen as analagous to the tangle and clutter and obstruction involved in border crossings and cross-cultural understanding. Wires snake from the light table and its microphones, from the table where composer Christopher McIntyre mans the laptop that delivers his score, and from Chris Cochrane’s guitar to the pedals he stamps on. From time to time, as if carelessly testing a signal, Rebeca Medina swings once around her head a long electric cord with a cluster of bulbs at one end. Kit Fitzgerald, in a live video performance, fills the back wall with maps and drawings and drawn-on photos that are often both beautiful and terrifying—rich colors, scratchy slashes, and blurry shapes you almost recognize, sometimes being scrawled over by white lines that wiggle like fat worms or snarling yarn. Is that a woman’s torso that all those other images float over, or an explosion? Once we are in a train; sometimes palm trees rush by; sometimes a city (New York?) is seen in the distance. A woman’s foot, photographed in close-up, rocks monotonously back and forth on her shoe’s high heel, going nowhere. When π=3.14 begins, everything is covered with an immense white plastic tarp (entering the theater, you see this shrouding taking place). 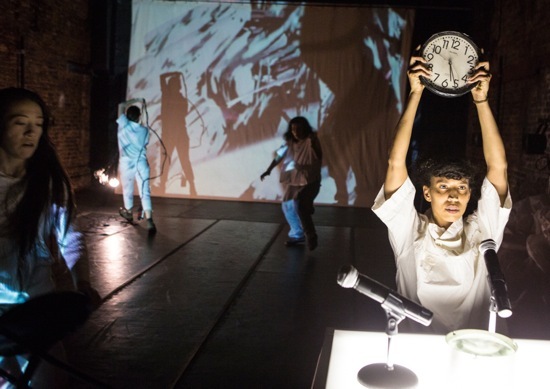 Chuma and Miriam Parker begin to uncover the space. They do this in spurts, checking with each other before each burst of action. As they thrash the tarp, it billows up like waves, like clouds, making a rustling, rainy sound. We know what lies hidden beneath, but also know that we might not know. 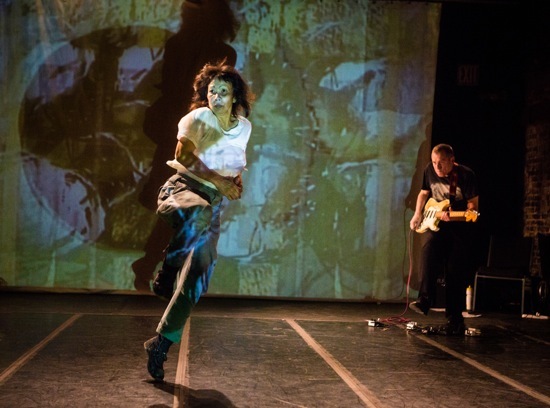 In previous works, Chuma has tangled—often hilariously—with musicians, but there’s nothing funny about the way she and Cochrane periodically interact (she has embedded her 2005 Guitar Crash in this new work). At the beginning, the rumble of bass notes that he slams out of his instrument incites Chuma to shove him, bump into him, hang onto him. He hunkers grimly down over the guitar and makes it howl. He steps on the pedals, and silence falls; when he plays again—something sweeter and more melodic, she comes at him more gently, but when separated, they tend to stare combatively at each other. There don’t seem to be any choreographed transitions. The performers move from one activity to a seeming non sequitur the way you switch off the light when you finished reading and go make a sandwich. They are so matter-of-fact that when Chuma starts making this-is-the-way gestures or “stop” signals, you’re not sure whether she’s actually cueing the media or guiding an invisible crowd. What makes McIntyre turn from his laptop and blare sound from his nearby trombone? Hard to say. He just does, and it adds to the cacophony that bespeaks impossible traffic conditions. What does it mean when various ones of the women hold up a clock whose hands seem stuck around 5:30? It’s our task to think about crossing time zones, about time running out. There is some astonishing dancing in π=3.14. Every now and then, one of the women is seized with an urge to move. Chuma has always danced like a wild woman, as if she can’t get out what she feels and works herself into a frenzy; sometimes she looks like a puppet whose strings are being pulled by a maniac. But Parker, Medina, and Garnica are also remarkable. Each has a moment to dance alone, and although each has her own distinctive patterns, all of them stress instability or uncertain balance. Their legs snarl, their knees buckle, their bodies cant oddly. Garnica jumps so heavily that you fear for the floor. She also keeps returning to sit on one of the folding chairs scattered about, but almost immediately jumps up again and starts dancing, as if she cannot rest for fear she’ll never express what she needs to express. Light and darkness collaborate. Chuma dances brandishing a flashlight. Sometimes a performer’s shadow—growing larger or smaller—blots out part of Fitzgerald’s video projections,. Whenever the other women switch on the light table, the atmosphere becomes slightly cozier. 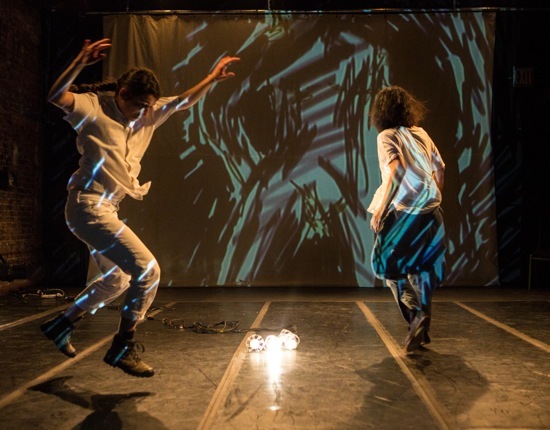 In one sequence, seated around it on three sides, Medina and Garnica engage in a rapid-fire dialogue that’s rhythmically interesting enough to be thought of as choreography. Questions are asked. “Would like to go to Colombia?” “Would you like to go to Maracaibo?” In this jumble of related questions and answers translated from and into French, English, and Spanish, the tactics are those of an interviewer and an interviewee (perhaps debating a visa). They keep switching roles without letting up in speed. Seated between them, Parker turns her head from side to side, following them as if at a tennis match. Parker, a wonderfully convincing actor, later turns her attention on us. “Do you have a reservation?” she asks. She’d like to interview us. It will be easy, she says. So friendly. And suddenly she’s telling us quite calmly and pleasantly of a documentary with missing footage, mentioning that she has been in captivity. And, yes, her entire family was in prison. Medina swings her light cluster. Dances. An earsplitting shriek blasts from the guitar. Chuma and Cochrane travel haltingly along together, her head seemingly glued to his shoulder. The clock display, the swinging lights, the crazy dancing, and the voyaging meet and intersect against a vista of rolling clouds. Yoshiko Chuma is leaving for Afghanistan immediately after her performances in the LaMama Moves Festival ends on May 18. 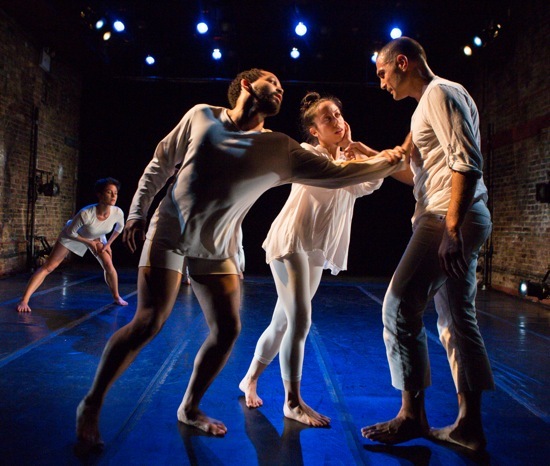 The School of Hard Knocks shares its LaMama programs with Rebecca Lazier’s There Might Be Others, a work-in-progress that the choreographer intends to expand. It provides a pleasant introduction to the evening, but is difficult to write about after having seen Chuma’s darker and more complex work. There Might Be Others is, in effect, a structured improvisation, and knowing that affects how we view it. The seven expert performers have access to a collection of movements, rules, possibilities, tasks, and games. So we see them making decisions, influencing one another, taking various risks—all of which they do very smoothly and with intensity of energy and focus. The recorded voice of Vladan Radnvanovic accompanies the first few minutes of the dance with a text that— in words both witty and irritating—poses questions designed to make us ponder what we are seeing in terms of present existence and past (I’m not explaining this well at all). Later sounds, such as something like radio static, a train, or rain take over. Or silence. Some of the movements quickly become familiar as people take them up or break away from doing them. One choice is to stand on one leg with the opposite knee lifted. Another is a kind of lunge. Another is a phrase of jumping steps that travel around the space. Another involves dropping to the floor and bouncing heavily while seated. There’s also, at a give point, an option for everyone to sing softly a tune that interests him or her, while interacting with others. In the small space, you can get interested in the dancers as individuals. You can choose to watch what Senaz Demirel is up to, or how Pierre Guilbault, Cori Kresge, Vincent McCloskey, Christopher Ralph, Anna Schön, and Tan Temal make their decisions. The way counterpoint emerges and shifts gears can capture your attention, but collaborations are the most rewarding elements to watch—people tangling or building something together. It seems to me that a potential problem with improvisation of this kind is that the playfulness and complications that arise can look, well, silly, or childish. Not that adults don’t play games (and adult dancers are extremely good at this), but Lazier’s plan, while sometimes yielding intriguing results, also makes me wish for more complex strategies and more unusual movement possibilities. Perhaps those will develop as There Might Be Others grows.